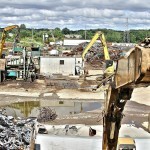 Ferrous Trading and Processing may be one of the biggest-if not the biggest- scrap metal recyclers in the nation, but it has not forgotten its core values to its customers and to the community. While the ideals of a small business are often lost in the move to the top, FTP has remained true to theirs. The company has grown to be one the country’s largest scrap metal processors and sellers, and has worked hard to retain the best attributes of its founding companies; particularly the ability to react quickly and decisively to issues and opportunities. When circumstances dictate, FPT can quickly deploy its breadth of talented personnel, equipment and capital to respond to developments while they are still fresh. The company is regularly complemented by its customers and associates for its ability to quickly mobilize. Quality: FTP maintains its core values even given that it has risen to be one of the most premier companies in its business- a heavy responsibility. Ferrous Processing & Trading has grown into one of North America’s premier processors, sellers and recyclers of scrap metals of all kinds, from massive auto shredding operations and specialty steel making and foundry products to nonferrous metals and industrial scrap management. FTP has become a key supplier to the North American metals industry as well as the major scrap metal manager for the nation’s auto industry.